Manufacturer: Meijer Distribution Inc., of Grand Rapids, Mich. Hazard: The sweatshirts have drawstrings in the hood. Children can get entangled and strangle in the drawstrings that can catch on playground equipment, fences or tree branches. In February 1996, the CPSC issued guidelines to help prevent children from strangling or getting entangled on the neck and waist drawstrings of upper garments, such as jackets and sweatshirts. From January 1985 through January 1999, CPSC received reports of 22 deaths and 48 non-fatal incidents involving the entanglement of children’s clothing drawstrings. 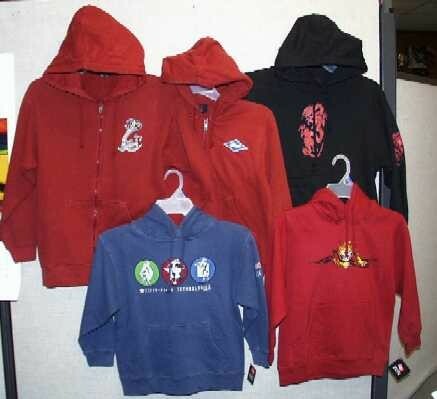 Description: The fleece sweatshirts were sold in children’s sizes 4 – 18 under the brand name, "Emergency Exit." The sweatshirts were manufactured in a variety of colors including red, blue, grey and black. Each sweatshirt has an image on the chest of either, a tribal design, dragon, motocross or skateboarding pattern. Sold at: Meijer retail stores in Michigan, Ohio, Indiana, Kentucky and Illinois from August 2003 and January 2004 for between $20 and $22. Remedy: Consumers can return the sweatshirts to Meijer retailers for a full refund or consumers can remove the drawstrings to eliminate the hazard.